Q: Why the Sidewalker and not a bicycle? Q: Why is the platform of the Sidewalker 5.5'' off the ground, and not lower? Q: How does the riding position on the Sidewalker differ from other scooters? Q: Will I hit the rear when kicking? Q. What is the material that the Sidewalker is made of? Q: How do I position my feet on the platform? Q: How do I kick? Q: What are your Warranty and Return Policies? A: Riding the Sidewalker, you are using more muscles and typically expending more energy per minute than on a bicycle. There is a stronger sense of freedom, possibly because you are not anchored to a seat. You are able to develop your own rhythm and style much more so than with a bicycle. When to kick and how often?, with which leg?, a short or long kick? etc...after a short time all these questions are all answered naturally. It all feels very natural. The Sidewalker will get you in shape faster than a bicycle will, and you will have more fun doing it. Gliding is such a thrill. Once you get some momentum, join your feet together side by side and enjoy a majestic glide. It's difficult to describe the feeling in words. A: Kicking is done by partial squatting of the stationary leg, so in theory, it is desirable to have the lowest possible platform height in order to minimize the degree of squatting, i.e, the effort required in kicking. However, in the real world in which we use a scooter on roads, we may encounter uneven pavement, bumps cracks, pot holes, stones, etc. A very low platform design would necessitate a low ground clearance below the scooter which might not be sufficient to clear obstacles. This could lead to an accident if and when, at a moment of distraction, you hit uneven pavement, bumps, cracks, pot holes, stones, etc. Since rider safety is #1 when it comes to design of the of the Sidewalker, it was decided to take the middle road: Allow for a safe minimum ground clearance yet maintain a reasonable platform height. So a 5.5'' high platform is a healthy compromise between the two conflicting factors. At 5.5'', is is still very comfortable to kick. There is no problem whatsoever for a healthy person to kick, and there will be no adverse effects on the knees. However, you will definitely strengthen your knees by riding a Sidewalker (more so than using other brands scooter which have a lower platform). Many scooter riders have switched to the Sidewalker after realizing the serious shortcoming of a very low platform design. Also, using a scooter with a very low platform can be quite stressful because you are constantly looking for the obstacles and your eyes are locked to 15 feet or so ahead of you. Using the Sidewalker is therefore more relaxing, and you feel free to explore all around you, similar to riding a bicycle. And by the way, strengthening the knees is important. It makes a difference when climbing stairs, walking, and running. A: For many scooters, the riding position is low and racing-like. For the Sidewalker, the position is upright and natural. This provides for a better view of surroundings, makes you more visible to others on the road and causes less fatigue. A: No, You will never kick the rear wheel of the Sidewalker. The kicking leg is always swinging longitudinally, so the rear wheel does not interfere, regardless of its size. 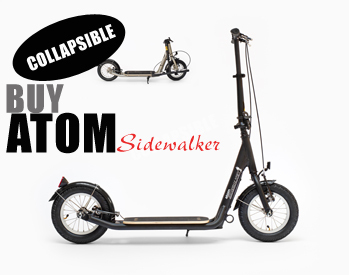 A: The Sidewalker is made from Chromoly steel which is significantly stronger material than most other scooters which are made from plain steel or aluminum. A: Place one foot on platform, but leave enough room for the other foot. After a few kicks, join feet together side by side as seen in photo. You should be standing facing forward, feet side by side. You are now gliding, free to choose with which leg to kick. A: See photos below: 1. Lift the kicking leg forward. The higher you lift, the more energy your kick will have. 2. Then swing it back. Follow through with your kick. Repeat several times to gain speed, then relax and join feet together and enjoy the glide. When needed, kick again with either leg. Remember you are free to choose which leg to use for the kicking. Two (2) years manufacturer's warranty on the frame and fork, under normal use. Jumping and "bunny hopping" are not covered. Wear and tear items are not included. box. Often the damage is only to the package, not to the Sidewalker. damage to the Sidewalker or only superficial damage to the box. If it is real damage, we will issue a call tag and ship a replacement immediately. you are covered under the warranty. Please let us know ASAP. you and cover the cost of replacement of the part, if any. to ship it back, in its original box in unused condition. Our prices include shipping the scooter to you. full purchase price minus the cost of shipping the scooter to you and back. We do not charge a re-stocking fee. Do you have additional questions about kick bikes or adult push scooter? Give us a call or contact by email.